The Prabhakar Post: Endangered Species:'The Indian Farmer"
As the World becomes a smaller place and our aspirations increase manifold,there is the spectre of famine and food scarcity across countries.from the late 1800s to the 1970s there has been increased mechanization of tools and methods such as the the Israeli 'drip irrigation' system. Yet the story of the Indian farmer is different!They haven't heard of Combine harvestors,Zybach's system etc .The bullock and the plough are the symbol even after a thousand years.Governmental apathy,almost no investments from the private sector have led to suicides in Maharashtra,Bengal and parts of Andhra Pradesh. From what I have seen,the population boom has led to smaller plots of land and in some cases in Punjab the division between brothers has led to such a division that the person holding the smallest portion finds it virtually untillable. 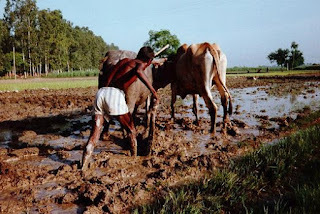 Most shocking is the lack of direct investments or incentives to farmers,many well known companies like Reliance,Bharti Group have bought up millions of acres but their plans are unclear.This lack of remuneration,the divide between big farmers and sharecroppers has led to increased migration to urban areas. In 1970 the agricultural sector emplyed 68% of the population which in 2010 stood at 39%.The other sectors have developed leaving agriculture at the mercy of the Monsoon and soil erosion.I know of a barber who came to the city in 1968 from Munger,Bihar.Over the years he would go every summer at harvest time but eventually he brought his 3 sons and bought them shops.Now with age he this year sold off his lands and has moved to the city permanently.It is this trend that shows no sign of reversing that is leaving India's fields bereft of expertise and hands to till and sow as well as putting pressure on the urban jungles to provide more facilities or opportunities. The yield is abysmal and combined with Global drought its showing with wheat prices up 50% since mid june.A lack of efficient distribution system with almost 20% of grains,legumes rotting means that inflationary tendencies get built up into the system right at the outset. My commentary is not an indepth research project but a macro pointer that unless we do something for the farmer and the framing sector in India,supply side inflation cannot be tamed despite whatever pronouncements made by the bureacrats at Delhi,neither will the dream that is India come to fruition what with all the inequality present!